SNEW's new album "You've Got Some Nerve" will be released September 17th, 2018. The album has been produced by Bobby Owsinski and engineered by Grammy winner J. J. Blair. Recorded at J.J.'s studio Fox Force Five in the Hollywood Hills. The first single from the record was released in July of this year. The song is called "UR Freaking Me Out" and is available on all digital platforms. The single "The Juice of Power"" kicked off 2016 debuting at #5 on the iTunes Rock Chart. This is a precursor to the band's fourth album currently in production. SNEW returned to Rocklahoma 2016 Memorial Day Weekend. Rocklahoma is one of the largest Rock Festivals in the United States. 2016 celebrates the Tenth Aniiversary of Rocklahoma. Held in Pryor, Oklahoma.Click Here to watch Snew's TV promo seen during Nationally televised episodes of "That Metal Show"
SNEW songs are in regular use by Major League Sports Teams. The song "Heavy Water" regularly played during NHL nationally televised games. The songs "Knock It Out Of The Park" and "Pick Up The Ball" regularly played during MLB nationally televised games, the NFL has used their song "Shinebox". "Stand Up High" appears in the supernatural thriller "Extraterrestrial" released through IFC Films and several SNEW songs were used in the documentary film "The Pioneers of LA Hard Rock and Metal" parts I & II. The band's web series "LIVE from the SNEWDIO" has just wrapped its first season. LFTS features special guests jamming live in the SNEW studio with the band and in depth talks during the round-table chat in between. Watch it anytime on the SNEW YouTube Channel. 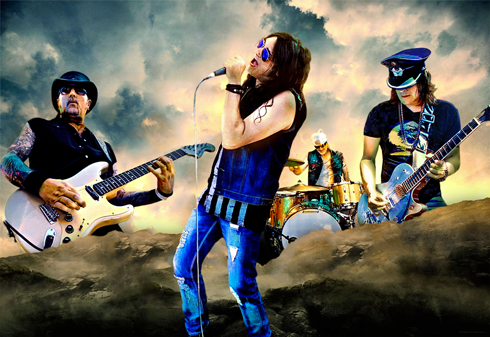 SNEW was voted one of the top ten rock bands of 2011 by military service men and women on the Dave Rabbitt military radio show. Long time producer Bobby Owsinski (Jimi Hendrix, The Who, Elvis, Ramones, Neil Young, Chicago) Author of 24 books, including"Music 3.0" Owsinski's books are required reading at Berklee College of Music & other major universities. SNEW's third album "What's It To Ya" was recorded and mixed by legendary Abbey Road engineer, Ken Scott (The Beatles, David Bowie, Jeff Beck, Elton John, Pink Floyd, Alice Cooper, Supertramp, Mahavishnu Orchestra). \m/ \m/ "Two Horns Up for the boys in SNEW, this is Rock Music at its finest"